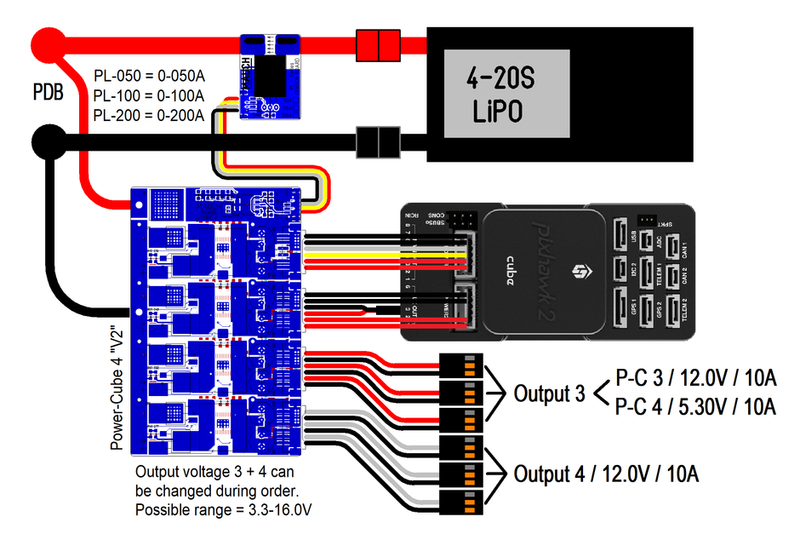 Input: 4-14S LiPo / max. 60V. 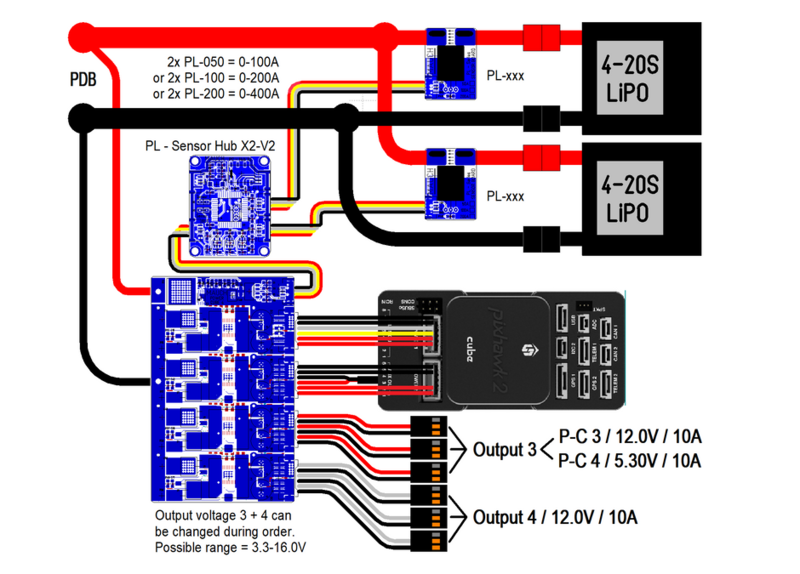 Output: 3x 5.3V / 10A 1x 12.0V / 10A –> Ripple 5mV (0.1%) at 5A output current. Delivery without 059: Power-Cube V3 Switch. Please order separately if required. Don’t use the power supply on high inductive loads, such as DC motors. The maximum allowable output for brushed or brushless DC motors is 5A. The Power-Cube series was created to take care of even the most demanding applications and is capable of powering virtually all types of equipment. The design is based on the LM5116 from Texas Instruments; without compromise and with better component selection (oversized FETs, SPEC capacitors from Panasonic…). Rated for continuous current of 10A with max. current at 15A (limit 20A). Status LED for each power output. 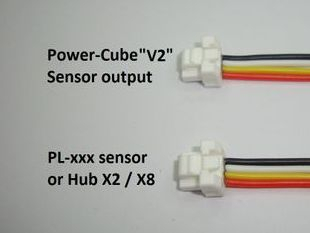 This cable connects the Power-Cube to either a Sensor Board or the Sensor Hub X2. This cable comes with all Power-Cubes. 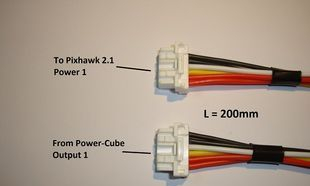 This cable connects the output 1 of the Power-Cube to the Power 1 input of the Pixhawk 2.1. This cable comes with all Power-Cubes. 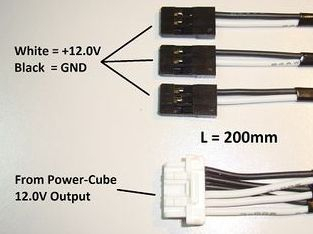 This cable connects the output 2 of the Power-Cube to the Power 2 input of the Pixhawk 2.1. 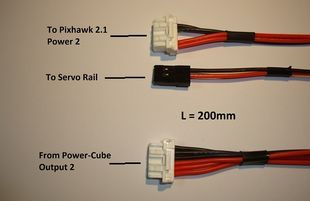 The JR servo connector can be connected to the servo rail of a Pixhawk 2.1, to power up opto ESC or any other equipment. Do not use to power up digital servos or any other high current consumption equipment. This cable comes with all Power-Cubes 2, 3, and 4. 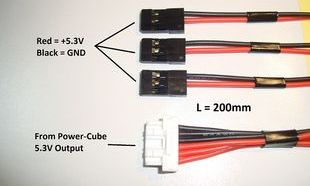 Connect to any 5V equipment. 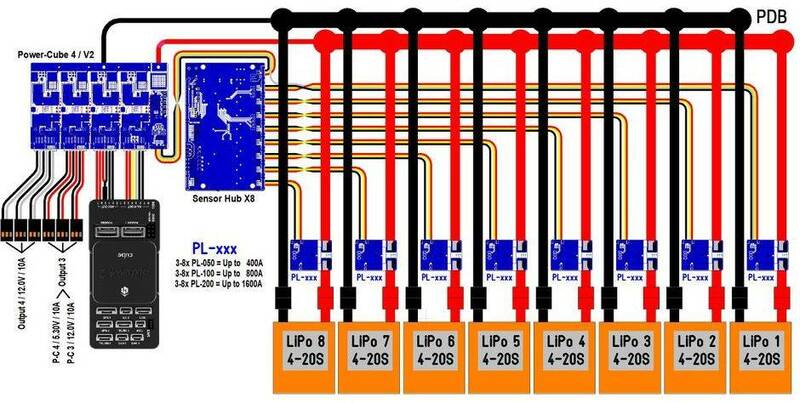 For example connect 2x JR to the servo rail to power up digital servos and the 3rd for LEDs. This cable comes with all Power-Cubes 4. Connect to any 12.0V equipment. This cable comes with all Power-Cubes 3 and 4.